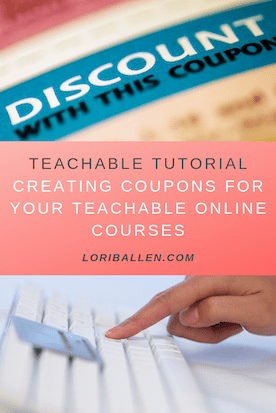 In this Teachable tutorial video, you’ll learn how to create coupons to discount your Teachable online courses for potential clients. My name is Lori Ballen and I’m a digital marketing strategist, speaker and coach. I own several businesses in various niches including real estate, weight loss (Keto), marketing, anti-aging hair care, and affiliate/influencer marketing. In full disclosure, I am an Amazon associate and am affiliated with many brands. Clicking on or purchasing an item through one of my links probably benefits me financially.